I HATED ABSOLUTELY EVERYTHING ABOUT THIS BOOK. EVERYTHING. LOUD NOISES! This was one of those novels that both Audible and Amazon have been recommending to me for over a year. I was so sick of seeing the stupid cover in my You Might Like… feeds that I felt obligated to just read it and be done with it. I honestly and truly assumed that I would enjoy it. I was so very wrong. So very, very wrong. I went with Audible. Mistake #1. I don’t know who the hell Kathleen Wilhoite is, but if you ever encounter her name as the narrator, DO NOT CHOOSE THAT BOOK. This woman tirelessly tries to be Joan Cusack’s voice, and it is painful. It is painful at normal speed and excruciating at three times the speed. This woman makes the fifteen-year-old protagonist sound like a whiny and incompetent five-year-old. Bernadette is an ex-architect who is well on her way to criminal insanity. Her husband is a bigwig at Microsoft. Their daughter, Bee, is something of a prodigy at school and has recently been accepted into a fancy-schmancy boarding school. As a reward, Bee has been promised anything she wants. Because she acts like a much younger child, she wants to go on a family trip to Antarctica, and because this book is stupid, her parents agree. The trip is planned and Bernadette becomes increasingly paranoid about it, forcing away her husband and not at all phasing Bee. 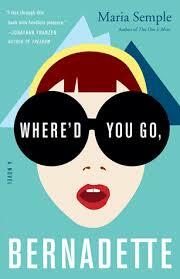 Ultimately, Bernadette disappears, apparently inspiring Semple’s oh-so-clever title. But don’t worry, she’s only gone for a couple of chapters, and then she returns. Why didn’t Semple call it, Why Did You Bother Coming Back Because We All Hate You, Bernadette? Semple is seemingly obsessed with creating a quirky and endearing novel, but her strenuous efforts have the opposite effect. Everything feels forced and uncomfortable. The characters are impossible to relate to and I found myself cheering for their misfortunes. Part of the novel is epistolary, part isn’t. Sometimes Bee pointlessly narrates and sometimes I just zoned out and prayed for it to be over soon. I wouldn’t recommend this book to anyone, so I’m not sure why both Audible and Amazon wanted to cause me such anguish. Whatever the reason, this book infuriated me in ways that I didn’t think possible, and I feel it is my civic duty to warn others that this novel is out there, and it is truly awful. oh wow yikes Dana. Well thank you so much for the very fair warning about the book!! !